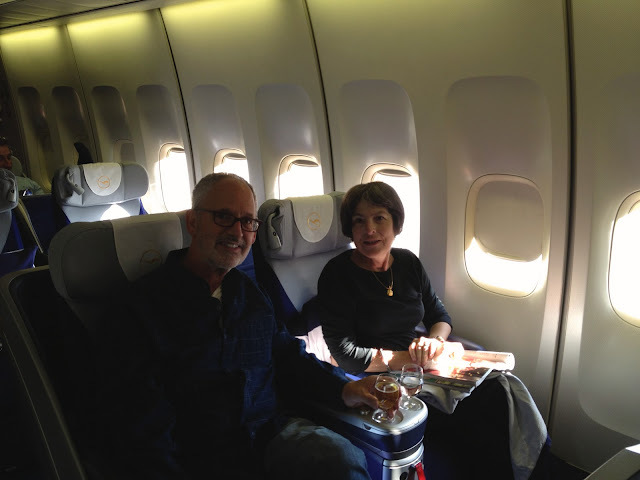 Our flight to India was uneventful, we drank (well I drank, Cathy doesn’t drink on planes). We flew Lufthansa to Frankfurt, met our travelling compaignions, Courtney and Ferris, who had arrived from New York and flew on to Delhi. This trip had two longs legs, 10 – ½ hours to Germany and 6-1/2 hours to Germany to Delhi. We slept a little on both legs of the flight. We arrived in Delhi, cleared immigration, and were met by our Indian Tour Manager. Raj. He is a definite no problem kind of man. He is a great fixer. In the past no matter what issues we have had, a text to him get a problem resolved. Everyone needs someone like Raj! The new airport in Delhi is beautiful. 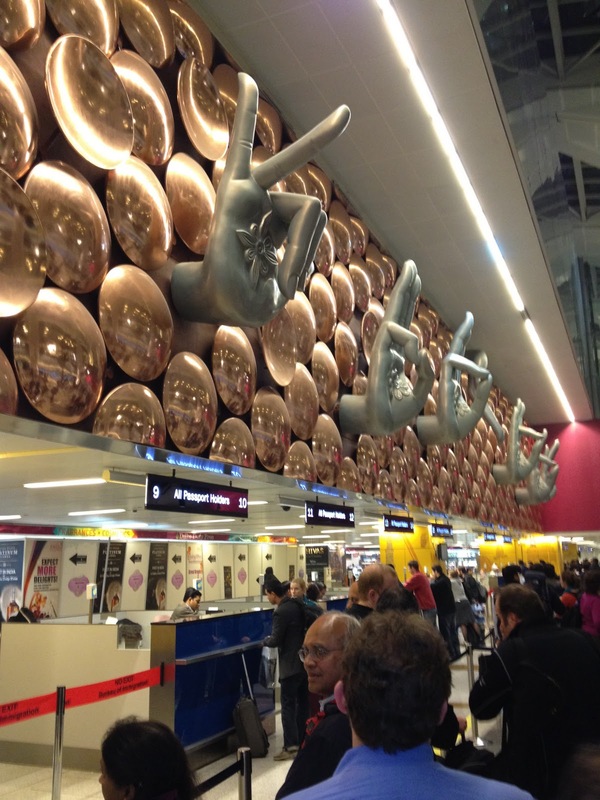 The immigration hall has these great hands in Buddha Mudras (the hand positions of the Buddha with fixed meanings). It is very welcoming. We exchanged our use cash for bundles of Rupees. At 50 Rupees to the dollar, and the largest Rupee denomination being R 500 or about $ 10. You get quite a stack of Rupees for your dollar. There are way too many to fit in a wallet. You simply dump them in your backpack and keep track of the backpack! The air is quite smoggy / foggy. It makes for an eerie presence as you exit the airport. We immediately saw men dressed in full Afghan regalia, by this I mean they basically looked like all of the Afghan fighters we have been fighting for the last 10 years. I am sure they were fine but none the less it was startling to see them. Once again we are staying at the Imperial Hotel in Delhi. The name says it all. It is like stepping back to the time of the Raj. Long marble corridors, polished brass, gleaming wood. This is not a new cookie cutter hotel, it is definitely of the old school and very properly run. It was 1:30am in Delhi when we arrived, almost 4am when we finally took sleeping pills and went to bed. Tomorrow is Sat, which means serious shopping! Maybe the stack of rupees will diminish. So -- what does the sign language mean? How wonderful that you're off to India again! You'll have an excellent time as you always do. Please greet Ferris from me. We're just back from Phoenix where Kim had back surgery a few days ago--hoping that this will relieve his chronic back problems before our scheduled trip to SE Asia March 15.